Introducing the all new Big Rig Mercedes Zetros Truck! This heavy duty ride on truck has a rugged assembly and can handle just about anything. With the large 13" solid rubber tires and upgraded motors, the Big Rig gets awesome traction and performance on any surface! The Zetros comes with a parental remote that has full operation of the truck if needed, but the kiddos can drive themselves if they're able. This truck includes a radio unit with multiple ways for your kids to listen to their favorite tunes while they cruise through the neighborhood. Your kids will be very comfy sitting on the plush leather seats as well. So if you're looking for a fun truck with all the bells and whistles, look no further than the Mercedes Zetros! This rugged Ride On Big Rig has upgraded factory installed drive motors for higher torque, and high output 12V batteries for more speed and fun! Exclusively sold right here, NOT sold in stores or anywhere else online. Dont fall for the Knock off versions being sold on the Big Sites & Marketplaces. 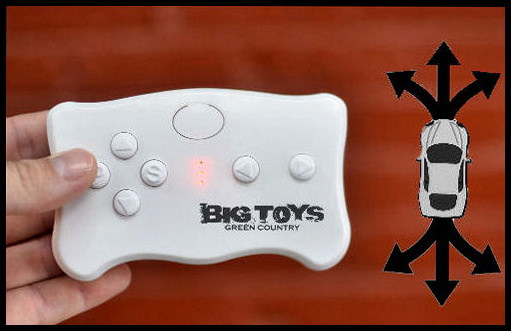 Only Big Toys Green Country has the fully loaded version with a Exclusive licence, Rubber Tires, Leather Seat, Upgraded Drive Motors, HD Suspension & Patented RC Parental Remote. Height 32" - Length 53" - Width 33"
Big Rig Ride On Mercedes Zetros Truck w/ Rubber Tires & Remote Control Introducing the all new Big Rig Mercedes Zetros Truck! This heavy duty ride on truck has a rugged assembly and can handle just about anything. With the large 13" solid rubber tires and upgraded motors, the Zetros gets awesome traction and performance on just about any surface! The Zetros comes with a parental remote that has full operation of the truck if needed, but the kiddos can drive themselves if they're able. This truck includes a radio unit with multiple ways for your kids to listen to their favorite tunes while they cruise through the neighborhood. Your kids will be very comfy sitting on the plush leather seats as well. So if you're looking for a fun truck with all the bells and whistles, look no further than the Mercedes Zetros! Click the button below to add the Mercedes Big Rig Ride On Truck w/ remote control & Rubber Tires - Red to your wish list.